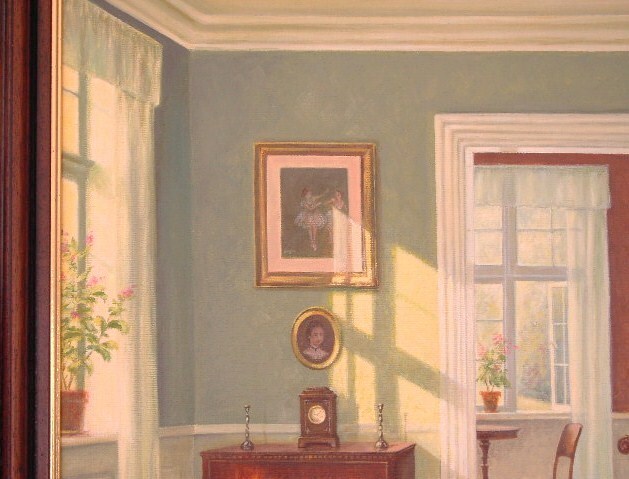 Note:- This after painting of mine is based on the original by Hans Hilsoe with changes described below. Please note that the following statement and modifications to my painting is purely imaginary. 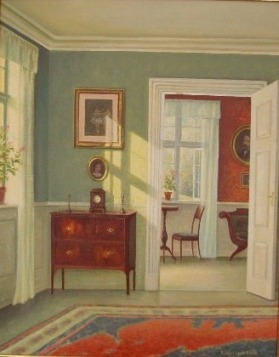 The painting of a Sunny Interior originally by Hans Hilsoe (a brilliant Dutch artist). From my imagination I have assumed someone like Edgar Degas would live in a house like this and so have modified the painting accordingly, i.e. 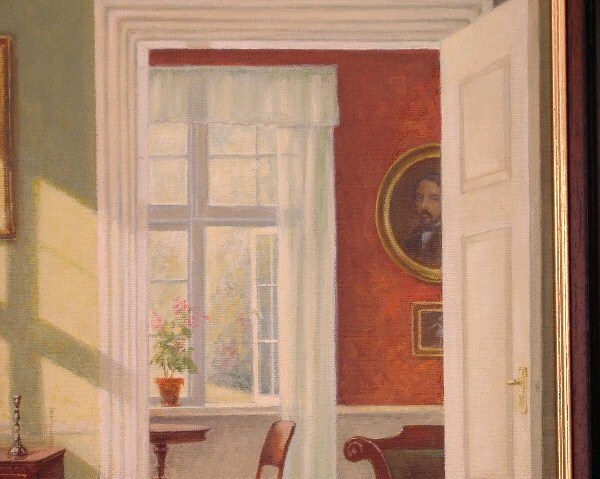 placing a picture of Degas ballet dancers in the first room and I have shown a part self portrait of Degas himself in the far room. Edgar Degas (1834-1917), was a French artist famous for his work in painting, sculpture printmaking and drawing. He is regarded as one of the founders of Impressionism although he rejected the term, and preferred to be called a realist A superb draughtsman, he is especially identified with the subject of the dance, and over half his works depict dancers. These display his mastery in the depiction of movement, as do his racecourse subjects and female nudes. His portraits are considered to be among the finest in the history of art.